Most non-bullseye shooters don't do serious accuracy testing. Since so many people in forums are loading for action pistol 9mm minor, and since people in that group often perpetuate an idea that ultimate accuracy isn't that important, people just look for good enough, and good enough ain't that great. People will test for accuracy at ten yards for a sport that shoots out to 35. People will make assumptions about the most accurate load at 10 yards being the most accurate load period, but that is far from true. I have tested loads against one another where the load that performed best at 15 yards was not best at 25, and conducted the test more than once on different days to show it was repeatable for the loads at hand. Bullets don't just launch from the muzzle in a slightly variable direction and travel straight to the target like a laser. They wobble and dance and drift further off the straight and narrow with each passing moment like a bridesmaid with access to an open bar. 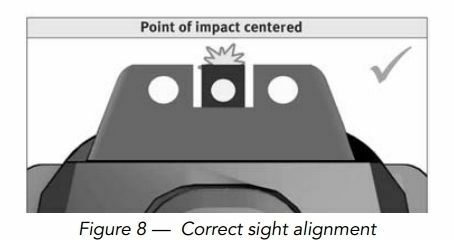 The longer it takes for the bullet to get home, the more the variables that affect accuracy are magnified, and sometimes the dominant variable at 10 or 15 yards is not the dominant variable by the time you get to 25 or 35. This is interesting, and peculiar...do people really test their ammo for accuracy at 10m distances? I never shoot groups at anything less than 20-25m, as you say what on earth would be the point of ammo testing at such close distances? I have never heard of anyone doing that before. Zhuk - I will address your 10m accuracy testing question - and this applies for me only. I am only interested in handguns that I can carry defensively. I don’t hunt with them anymore, nor do I shoot games. My “range” guns are also carry guns. With that in mind, virtually all of my shooting is done at a distance of 25m or less, and 90% of it being at 10m. My thought process being that if I ever have the misfortune of needing to use the firearm defensively, it is most likely going to be a “get off me” or some type of contact shot. If you are touching off rounds for defensive purposes at 25m, you’re going to have a lot of explaining to do....so when I am developing loads for a new gun or working with a new bullet / powder combo, I am looking for as close to a 1 hole group @ 10m as I can get. CZ, when developing the CZ-75, used the 124 gr. Sellier & Bellot ammo as their development and later standard ammo. It doesn't surprise me that so many folks mention that bullet weight in this discussion. I was surprised to learn, in a discussion on the S&W Forum, with Randy Lee who developed the new Apex barrels for the S&W M&P line, that Apex has found the aluminum-cased 115 gr. Blazer ammo to be one of the most accurate 9mm they've used, and they now use it in barrel development. That doesn't mean it would be the most accurate ammo in a CZ, but it does suggest that the rounds are pretty consistently loaded, and that you won't see a lot of variance in individual round performance when using that ammo. I mostly shoot Georgia Arms 115 gr. "Canned Heat" in my 9mm guns. (Except for self-defense ammo, I shoot Georgia Arms "canned heat" in my .40s, .45s, and .45 GAP pistols.) I've used a lot of Golden Saber when using self-defense loads, and haven't seen much difference in performance based on bullet weight for a given caliber. When people are loading for action pistol shooting, one of the prime characteristics loaded for is power factor (weight*velocity/1000). Since you know the bullet weight ahead of time, and you know the power factor range you are looking for, you are basically looking for a velocity range as a starting point. I test initially at 15 over a chrono during load development. That is close enough for me to shoot precisely at a decent pace and not drag it out, but far enough to see how one load groups against another. After that, I have it narrowed to one or two charges, and I will do additional tuning at 25. Some people train at the range they think they are most likely to shoot. 115Gr for target practice and 147GR HST for carry ammo. I usually shot 7-15 yards. Not peculiar. It's actually quite common. Folks who shoot at much greater distances are less common than you think. There's NOTHING WRONG with shooting groups at 20-25m, but if you're ever involved in a self-defense shootout with an opponent who is 25 meters away, you 1) might find yourself shooting at a distant moving target when you ought to be getting out of Dodge (making yourself a hard-to-hit target), if that's possible, or 2) you might find yourself dealing with a irritated district attorney (or civil litigant) who is questioning your use of a handgun at such distances. Civil suits can be a real pain, even if you're found to be "good" for a self-defense shooting by the local legal authorities. If your opponent (in that self-defense situation) is using a long gun, you do what you have to do. Most of my practice is from 30' to 50', with some quick shots taken at closer range -- but the closer shots are almost always "point shooting" not really aimed fire. Bullseye and PPC both have indoor and outdoor courses of fire - 50 ft Indoors, out to 50 yards outdoors. I carry a S&W 638-2, so measuring distances in yards/meters (rather than feet) is strange. 20' (or @7 meters) is a good distance for testing loads with a handgun. I can actually hit something (and even group!) with a .44 Magnum in DA mode at 7 meters, for example. 25m = @75 feet. There are a lot of handgun sights that completely cover/obscure a target at that range. 124gr JHP from Precision Delta. Super consistent and accurate when loaded to your guns liking. I am a fairly new reloader - first year but now have a few thousand under my belt with what I think are spectacular results. Cheaper, more accurate, more reliable and less "snappy". When my buddies at matches ask why I shoot JHPs referring to cost, I tell them that the consistency at 7.5 cents/bullet is a tiny bit more but well worth it! Gotta buy a couple thousand when on sale to get em that cheap. I've been using the 115 grn Berry's and I like them quite a bit, I'm with you on the snappiness of them though. I found that if I keep them around the 900 fps range they function quite well as far as having a tight group. I just realized we are talking about apples/oranges (not you in particular, Walt). If you are using an NRA 25m pistol target, then 25m is a fairly long distance. A lot of sights cover the center ring at 75-85 feet. If you are using a human silhouette or gong, then grouping is a somewhat different animal. In my approach to testing 9mm loads, you want a very precise and accurate group at 20 feet or so, when drawing/presenting/shooting. When you are first developing loads, I would concentrate on the initial groups vs. follow-up shooting. In other words, once you have a nice consistent load that groups, then practice with shooting a string of 10 cartridges. Usually, you won't get major surprises. However, I found that 6.2 gr Unique was optimal with the 124 gr bullet in slow-fire at a distance, but 6.0 gr Unique performed much better in rapid-fire, in terms of shooting to POA/POI (just for example). Someone who is law-abiding and "minding their own business" will typically be shooting at very short distances. I agree. I continue to wonder why so many gun makers continue to design their sights for what some call the COMBAT HOLD which some describe as Sight Image 3, below. (It's hard to get clear DEFINITION of "combat hold" on the next... A lot of folks talk about it, but few really describe it. Just HITTING the gong is good enough for me -- I don't worry about groups!! As you note, at greater distances -- maybe 30-50 yards or beyond, a small target can be obscured. 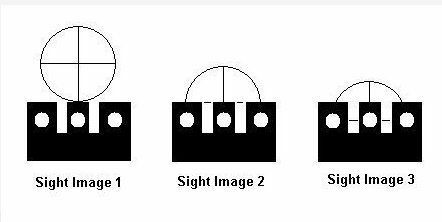 (If someone is shooting at you from cover, and you've got to return fire -- and can't run away -- sight image 3, below, can be a problem. Another internet site defines the "combat hold" like this the image below. No wonder folks get confused! I like the last two images, no matter what they're called, and most of my handguns shoot where I want them to, when I do my part using that type of hold. I figure that if I ever have to use a handgun in self-defense, it's going to be up close and personal. Getting back to the thread topic, my Cz's, Cz Clones, and all of my other 9mm Pistols work best with the 124 grain Bullet weight, and mostly I shoot the Berry's 124 grain Flat Points. I have played with and loaded all other Bullet weights in 9mm Luger, and always return to the 124 grain Bullets.